Sharon Duggal’s debut novel, THE HANDSWORTH TIMES was published in September 2016 by Bluemoosebooks.com. It was chosen as The Morning Star’s fiction ‘Book of the Year 2016‘ and as the title for Brighton City Reads 2017. Read reviews of THE HANDSWORTH TIMES here. Mukesh Agarwal sits alone in the Black Eagle pub, unaware that a riot is brewing or that Billy, his youngest son, is still out on his bike …A mile away, at home in Church Street, Anila, one of the three Agarwal girls, is reading Smash Hits and listening to Radio One as she sprawls across the bottom bunk, oblivious to the monumental tragedy that is about to hit her family. 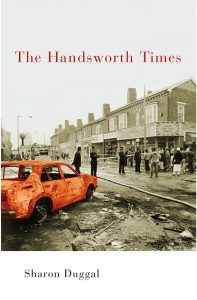 It is 1981 and Handsworth is teetering on the brink of collapse. Factories are closing, unemployment is high, the National Front are marching and the neglected inner cities are ablaze as riots breakout across Thatcher’s fractured Britain. The Agarwals are facing their own nightmares but family, pop music, protest, unexpected friendships and a community that refuses to disappear all contribute to easing their personal pain and that of Handsworth itself.